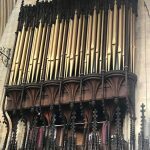 Although the organ contains earlier pipework, some dating back to 1717, it is essentially by HARRISON & HARRISON of Durham, who built it in 1939. 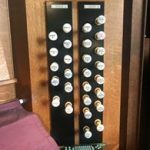 Harrisons are also the builders or restorers of the famous organs in Westminster Abbey, the Royal Albert Hall, King’s College, Cambridge and Lincoln Cathedral, and are the premier organ-builders in the U.K.
Our organ has three manuals (or keyboards), plus a pedalboard for the feet. 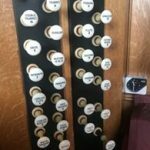 The sounds are controlled by a total of 53 drawstops, some of which you can see when you look up into the organ-loft. The gilded pipes that you can see in the organ case used to ‘speak’, but are now just used for decoration. 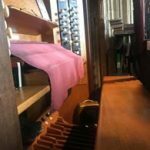 The organ contains a total of 2,260 pipes, all of which are in the chamber behind the case, on 4 levels, from the ground up to the top of the arch which you can see above the organ case. The organ is electrically blown by a 5 h.p. motor, and the signals from the organist’s hands at the keyboards are also transmitted to the pipes through a low-voltage electrical relay system.